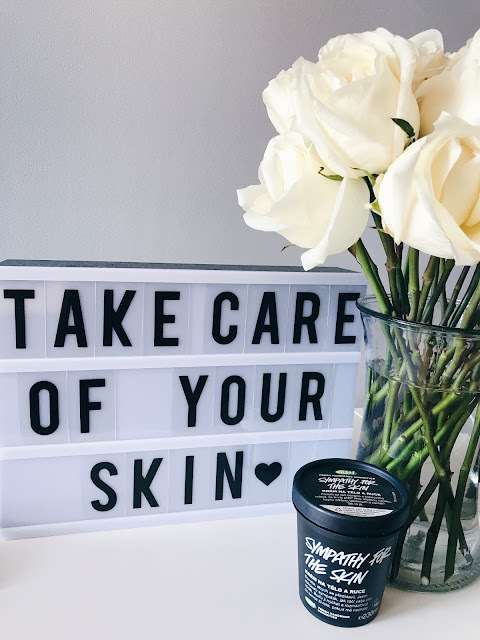 My daily ritual is quite simple, I believe in "less is more" if it comes to both makeup and skin/bodycare, however, that is one more reason to make sure I use really good quality products that meet your expectations. One of the reasons I like using Lush is the transparency if it comes to the ingredients in their products, you won't find a way too long of a list of ingredients on their products and you get what you hoped for. Simply said when I decided I wanted to get a coffee scrub I was longing for the familiar smell of coffee that I love so much and a softer skin after use and that is exactly what this cup delivers. Coffee scrubs/masks are very popular now and you can buy them from many different brands but I'm very happy with this one and besides the obvious benefit of having a softer skin (which feels great!) I also feel good about the #ethicalbuying aspect because I don't want to think about illegal child labor being responsible for picking the coffee beans for my mask. You can buy this coffee mask Cup o' Coffee on the Lush website or in the stores. Kavovou masku Cup o' Coffee muzete koupit na strankach Lushe nebo v kamennych obchodech. Oh and my favorite ever body lotions are from Lush too... this month I've been using Sympathy for the Skin and it's delicious. A nezapomente ze moje nejoblibenejsi kremy na telo vsech dob jsou take od Lushe... tento mesic pouzivam Sympathy for the Skin a je vyborny.